This is the fourth volume in the ‘British Secret Projects’ series from Midland Publishing. I have been interested in many of the 'Secret Projects' and 'X Plane' books available over the last few years despite only a passing interest in Aircraft modelling and have all the German WWII versions as well as US X planes, Soviet X planes and British secret Bomber and Fighter editions. 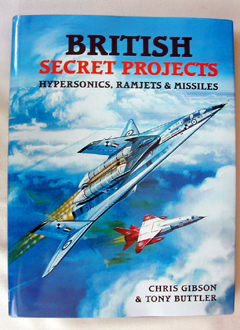 I recently purchased the latest in the line up ' British Secret Projects- Hypersonics, Ramjets & Missiles' published this year (2007). Hard backed, with 192 pages filled with development drawings, test photographs and colour reproductions as if in service, this is a very readable book as well as being ideal to dip into. Text is arranged as a newspaper in three columns per page and a lot of technical information is presented. However you don't need a degree to understand it as it is pretty well explained throughout with the final pages devoted to a glossary, Ministry of Supply codes, Operational requirement codes and a brief on Radar types before the main index. The book breaks down into 16 Chapters plus the already mentioned annexes. The chapter headings are varied, ranging from 'Origins of Guided Weapon in the UK', to 'Standing Start to Mach 5- The Combination Engine'. They cover eras from WWI to the 'Cold War' and TSR2 even mentioning advanced projects such as space delivery planes and supersonic military transport planes, all remember, official projects of the time. Visitors to this site will no doubt enjoy this book. It contains references to some of the real craft reproduced as resin models by Allen B Ury's 'Plastic Fantastic'. In addition, as many of the developments lead on from or culminated in service weapons there is a lot of factual information on service weapons such as Blowpipe, Sea-dart and Bloodhound. As an indicator of the creativity being shown during the Cold War it is also of interest (unmanned mach 7 launch platform for anti satellite system for example) as well as providing ideas for scratch builds of your own. Written jointly by Chris Gibson and Tony Butler, it is available in the UK from Midland press, worldwide (except Northern America) from Midland counties publications and in North America from Specialty Press publishers and wholesalers Inc. This page copyright © 2007 Starship Modeler. First posted on 4 September 2007.